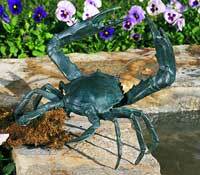 Crab Sculptures - Click on an item for more details! 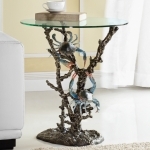 This beautiful Blue Point Crab and Coral Sculpture Table comes to life before your eyes. It makes for a stunning and functional accent to any room, office, or patio. 21.5"high 22"wide 22"deep Premium Grade Aluminum and Glass.